No u do not need that! – Start now learning! The Facilitator asks the group to make a circle around her/him and explains to participants that the aim is to react quickly to the statements he/she shouts. If they agree with the statement they shout “Yes! We need That!”, while jumping one step forward, towards the centre of the circle. If they do not agree with the statement they shout “No! We Do Not Need That!”, while jumping one step backwards. The key to the success is for all participants to reach as quickly as possible. The energizer continues until all statements are read by the facilitator. Do we need drinking over our limits, getting drunk? Do we need shopping like crazy until we get into debt? Do we need stressful situation? Do we need junk food or snacking all the time? Do we need sitting all day and night? Do we need eating cakes, chocolates and sweets all the time? Do we need a house over our heads? Do we need a kisses and hugs? Do we need peace and quiet? Do we need ….. The facilitator can think of statements which will definitely lead participants to say YES. At the end to close the energizer, and leave participants with positive feelings and thoughts, the Facilitator can make a funny statement which will make all participants laugh. Materials: Printed A3 photos of Smoking, Harmful Use of Alcohol, Unhealthy Diet or Snacking Non-Stop, Overworking, Physical Inactivity, Too Much Time Online, Overspending Into Debt, Getting Sunburn, Behaviour Leaving you angry, worried, or stressed, Overusing Pain Killers and Sedatives, Appendix 1 & 2. Appendix 2: Definition of noncommunicable diseases according to WHO, post-its, pens/pencils, A2 or flipchart paper. Preparation: The Facilitator prints out photos of lifestyle habits (size A3 – please see Appendix 1: Photos of Lifestyle Habits with high risk for noncommunicable diseases) which are universally identified as risk factors to noncommunicable diseases (please see Appendix 2: Definition of noncommunicable diseases according to WHO). Then he/she places each photo on different A2 or flipchart paper, leaving a lot of space under the photo. Each paper should state “Did you know that…….can cause…” filling out only the risk factor and leaving the end empty. For example “Did you know that Smoking can cause…. ? The Facilitator divides the group into small groups of 5-6 people and distributes Post-its (of different colours). Then she/he starts “Did you know that… a lot of habits or lifestyle practices increase the percentages of badly affecting health and in many cases cause noncommunicable diseases?”. Then the Facilitator presents Appendix 2 to present the definition of noncommunicable diseases according to WHO, to She/he presents each photo to participants and asks them to work in group, discuss, exchange views and ideas and write on post-its what each habit/risk factor can cause to a person’s health. They can write as many as they want. Participants are provided 30 minutes to discuss in groups and prepare their post-its. Then the Facilitator places them on the floor / or on a table and asks each group to place their post-its with their answers under the relevant photo. A2/Flipchart papers can be put on the walls during the workshop. Results can be photographed and posted on websites or social media for dissemination of information and awareness. The Facilitator reminds participants that the most common types of noncommunicable diseases (NCDs), as identified by WHO (hint: it will be good if there is a project and screen in the room to project the definition – see Appendix 2 Appendix 2: Definition of noncommunicable diseases according to WHO) are cardiovascular diseases (like heart attacks and stroke), cancers, chronic respiratory diseases (such as chronic obstructive pulmonary disease and asthma) and diabetes. The Facilitator divides the group into 4 sub-groups and informs them that each group is a different Youth NGO and one of their projects is to design and apply an informative and awareness raising action plan on noncommunicable diseases to children or young people they support. 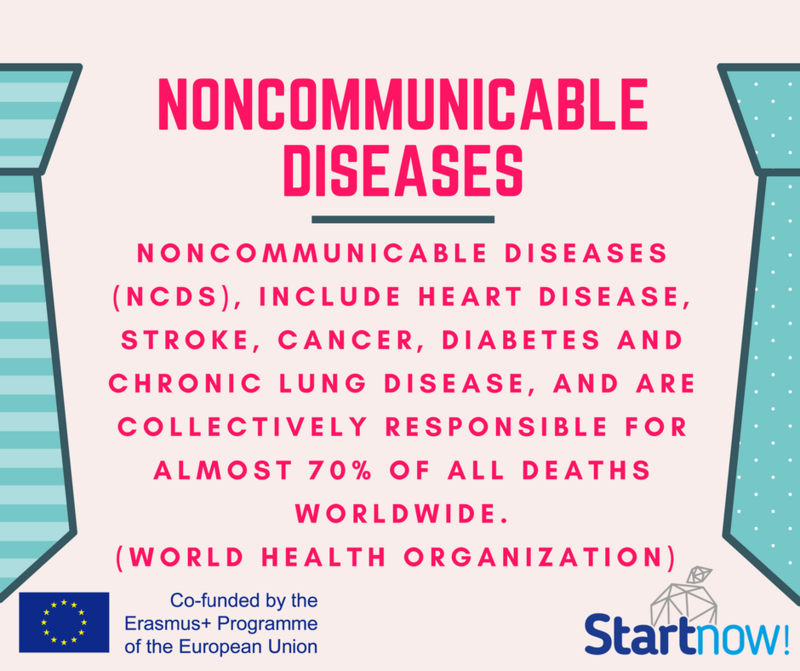 Each group is assigned with a different noncommunicable disease namely: a) Cardiovascular diseases, b) Cancers, c) Chronic Respiratory diseases and d) Diabetes. Each group has to search the internet for valid resources of information on the NCD assigned, discuss and write down on A2 paper and with a creative and innovative way, the following: a) Title: NCD, b) Definition of the NCD using simple terms, understandable to children and young people. C) Well known forms of the specific NCD, d) Risk Factors / possible causes and e) Who is at risk, f) Socioeconomic impact of NCD and g) Prevention and Control of NCD. The discussion and preparation of products may have duration of 40-50 minutes. At the end of time, the Facilitator asks each group to present their A2 papers, informing the others on the NCD assigned to them. Time for discussion is provided for each presentation. This may have a duration of 40 minutes. The Facilitator emphasizes that awareness and prevention plays a crucial role in preventing noncommunicable diseases and that for prevention measures and practices to have an impact, a strong action plan must be designed covering the most important stakeholders who might be involved on the issue. At the beginning of the exercises the Facilitator draws a circle writing noncommunicable diseases in the middle. Then she/he asks the group “Who do you believe are the important stakeholders in designing and implementing a strong National Prevention Action Plan to actually have an impact on young people and the society?” All participants are invited to express their opinion, while the Facilitator monitors the discussion and notes down on the flipchart the views/opinions. At the end, the facilitator goes through the list and finalises the stakeholders who are believed to play a solid and core role on the issue. It is estimated that this discussion will have duration of 10-15 minutes. Then the Facilitator divides the group into sub-groups of 5-6, or less according to the most important stakeholders identified previously. Each group is assigned the role of one stakeholder and is asked to discuss (for 30 minutes) and write down awareness measures or good practices which they believe could be important to be included in a National Action Plan for Prevention of Noncommunicable Diseases. Participants can use electronic devices for ideas, data and information from online sources. At the end, each group presents their conclusions, while other participants can contribute with more ideas and views, during each presentation. The discussion may have a duration of 15 minutes. The Facilitator asks participants to sit on a circle and share, if they want a personal story, related to the various risk factors, which led to a noncommunicable diseases. The story can be either a personal, one related to a relative or a friend, or something they read. The Facilitator urges participants to listen carefully to the stories and share views, ideas, or elaborate or connect other stories and so on. This exercise can last from 30-45 minutes, depending on the participants who feel comfortable sharing stories and the interventions by the others. Participants are given 30 minutes to prepare their conclusions, in the form of creative innovative posters. At the end, each group is requested to present their results to the others to raise awareness and disseminate information on effective practices and programmes organized in their countries to prevent NCDs. At the end, the posters can be put on the walls in the room, photographed and disseminated online through websites and social media. Materials: Electronic devices with internet access, pens/pencils, Flipchart Papers: Flipchart 1: Cancer, Flipchart 2: cardiovascular diseases, Flipchart 3: chronic respiratory diseases and Flipchart 4: Diabetes. The Facilitator informs participants that the current activity focuses on the most known risk factors to Non-Communicable Diseases. She/he divides the group into four (4) subgroups and gives each group one of the following Flipchart Papers. Flipchart 1: Cancer, Flipchart 2: cardiovascular diseases, Flipchart 3: chronic respiratory diseases and Flipchart 4: Diabetes. The title of each Flipchart is drawn in a large circle in the middle of the paper. The Facilitator explains to participants that the aim is to brainstorm, discuss, search and create a mind mapping of all risk factors (known or not so well known) which may cause the non-communicable disease they are assigned. So, each group is asked as a first step to “Label risk factors related to the disease they are assigned”. In order to do that participants are instructed to draw lines around the circle and label them. Then participants are asked to “Label some characteristics of the specific risk factor”. Participants are instructed to draw sub-lines on each line labelling risk factors. Then participants are asked to “Label any other information you consider relevant to the characteristics of the specific risk factor which is consider to cause the disease”. Groups are given approximately 30 minutes to prepare their mind maps, in a detailed and comprehensive way, using innovation and imagination. At the end of the group discussions, each group is provided with 10 minutes to present their mind map to the others. The Facilitator urges participants to intervene during each presentation, and provide views and ideas on the content of each mind map. At the end, the results can be put on the walls in the room, photographed and disseminated online through websites and social media.